Mercato Centrale, the popular food and lifestyle market from Metro Manila, will be bringing its food-tripping experience to Ayala Mall’s Centrio, Cagayan de Oro with MERCATO DE ORO starting December 7 (Saturday)! Mercato de Oro will feature a night food and entertainment market every Friday and Saturday (4pm-3am) and a morning gourmet food and ‘fresh and organic’ market every Saturday (7am-2pm). MERCATO DE ORO is managed by the Mercato Centrale group, which has successfully organized food markets in key Ayala Malls locations around Metro Manila which include MidnightMercato in Bonifacio Global City (The Fort), Taguig, Mezza Norte in Trinoma Mall, Quezon City and Cucina Andare (the first food truck market in the Philippines) in Glorietta Mall, Makati. We are excited to bring the successful formula that has made the Mercato Centrale group of markets such a hit among Metro Manila foodies: A variety of great-tasting, innovative and affordable food choices, a selection of fresh, natural and organic fruits, produce, meats and seafood, gourmet and artisanal food and pastry products, unique arts and crafts, live acoustic entertainment and a festive atmosphere!” shared Anton Diaz, co-founder of Mercato Centrale and the award-winning blogger behind the most popular food and travel blog in the Philippineswww.OurAwesomePlanet.com. “It’s free entrance as well! This is why the Mercato Centrale markets have become very popular foodie destinations for Manilenos, balikbayans and tourists.” Anton added. “MERCATO DE ORO will be food and lifestyle market where the home-grown entrepreneurs of Cagayan de Oro, Bukidnon, Iligan, Ozamiz, Pagadian and the other neighboring provinces can showcase their local cuisine, specialty dishes, fresh and organic fruits, vegetables, meats and seafood, and locally-made arts, crafts and collectibles.” shared RJ Ledesma co-founder of Mercato Centrale and a TV host for GMA News TV’s Best Men (who was more popularly known as Joey in the Royal Tru-Orange series back in the eighties). “We are also bringing over the best-selling food vendors from our Mercato markets in Manila to be part of MERCATO DE ORO.” RJ said. “We are also looking for the next big food entrepreneur from Cagayan de Oro who wants to bring his business to the next level!” said Anton. “The Mercato markets have been the birthplace of many expanding Manila food businesses like Manang’s Chicken, Merry Moo Premium Ice Cream and Chuck’s Grubberie Fish and Chips. In fact, one of our pioneer vendors, Mochiko Ice Cream, already has a branch here in Centrio! MERCATO DE ORO is located at Ayala’s Centrio Mall, Cagayan de Oro. The night market will be open every Friday and Saturday (4pm-3am) and the morning market will be open every Saturday(7am-2pm) starting December 7 (Saturday). 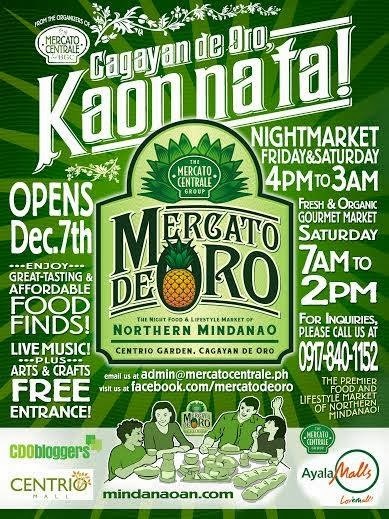 For interested food and bazaar vendors from Cagayan de oro, Bukidnon and the surrounding provinces who want to join MERCATO DE ORO, please contact (+63 917) 840-1152 or (+632) 812-0102 or email admin@mercatocentrale.ph or visit www.facebook.com/mercatodeoro. You can also pick up an application form at the administration office of Ayala’s Centrio Mall. The KAON na ta treat sounds so inviting. Is this still up and running? Also, is this anywhere near a home located at Cagayan de Oro, if it is that'd be good news.